Feb 18, 2011 — We didn't stay longer at the A-Ma temple as more tourists came inside and got the whole place crowded. We went back to the bus stop to catch the bus no. 21 (the one that goes to Macau Tower). I was really excited to finally see the Macau tower up close. I really made sure that I included it in our itinerary for this trip. 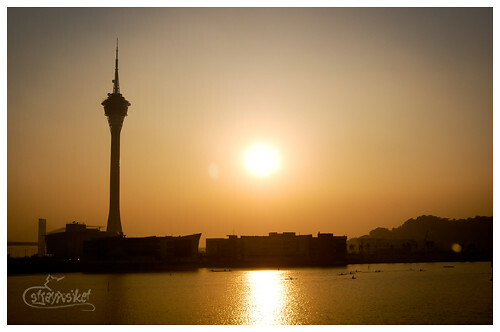 Macau Tower. Taken during my trip back in 2008. The only bus that goes to Macau Tower from A-ma temple is Bus 21. It arrives every 75 minutes as its route includes Coloane. We could have taken the taxi but since we're cheap, we opted to wait for the bus. Mainland China can be seen at the background. After 20 minutes or so, the bus 21 finally arrived. Unlike the typical buses in Macau, this one was a coaster type bus. We're the only ones who got on the bus. Besides us 3, there was only 1 passenger aboard. I’ve carefully studied the bus route and I'm 100% sure that the next stop after A-ma Temple is the Macau Tower. So at the sight of the tower, we prepared ourselves to get off the bus to our shock, the driver didn’t stop and zoomed off. We all stared at each other and before we knew it, we're already approaching the bridge to Taipa. There's no way we can get off the bus. All I could remember was uttering the word "Hala" a number of times. As soon as we reached Taipa, the lady pressed the button and got off on the next bus stop. That's when we realized that we had to press the black button located at the ceiling that's barely noticeable. We had no idea where we were heading so I took out my Ipod and reviewed the bus route. Thankfully, the bus stops at the airport. So when we finally reached the airport, we got off pretending to the driver that we weren't lost. Haha. We were supposed to look for the MT1 or MT2 bus to get to Lisboa but to our surprise, there was a Grand Lisboa shuttle waiting right there. 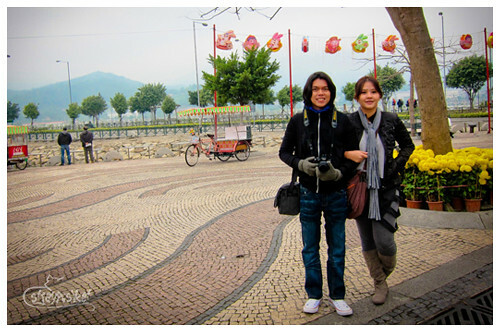 We may have failed to see the Macau Tower, but the experience we had was memorable. At least there is something we can laugh about whenever we see the Macau Tower. Lesson learned? Take the cab. Hahaha.